TopResume.com is the big young up-and-comer of the last couple of years. Headquartered in NYC, they seem to be an offshoot of a silicon valley startup called Doostang, founded back in 2007 as a job search network for college kids. What do they call it? A pivot? It seems they "pivoted" to resume services in around 2014-2015. 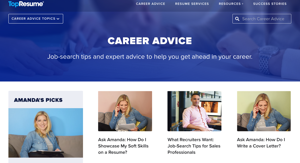 And they subsequently have acquired one of the "big three" traditional resume services, CareerPerfect.com. In short, they have some big money behind them. Whether that pans out into quality services for the long haul remains to be seen. TopResume.com is presently not a member of the Better Business Bureau and it is so young that they haven't yet achieved a BBB ranking. However, the number of officially filed complaints in the BBB record give me serious pause. I'm giving them a high ranking because of their pedigree, and in the hopes that they are merely going through growing pains as they have acquired and absorbed other competitors. But if they don't improve their complaint record, or even simply get accredited with the BBB (!!! come on! You can't consider yourself a major player without doing so!) I will strongly consider dropping their rankings next year. This company just came on the scene. It's website boasts a slick, modern design that should give some comfort to the aesthetically adept crowd, but certain features aren't quite there yet - I've got to imagine it's just a matter of time before the website is fully completed. TopResume.com offers only three levels of service, and that's it! No packages, no mix and match! If you'd like to view some of their work, they don't even deign to offer sample resumes. But they do offer a 60 day guarantee. TopResume is generally right in-line with the industry average for price. No data on customer satisfaction rates or anything like that. TopResume makes no claims to be affiliated with the Professional Association of Resume Writers, Career Directors International, and Certified Professional Resume Writers. In fact, they don't mention certified writers at all, only a "network of over 1,000 writers." Well, ok, if I go on fiverr I can find a thousand "writers" but not "resume writers" and certainly not certified resume writers, as there are less than 1,000 of those in the world.